Analysis of twitter data is quite a hotcake these days, plenty of material is available to learn "How to analyze Twitter" data, but most of them don't tell how to extract it from Twitter. @Ask Analytics, we are going to discuss "How to extract data from Twitter" and then we would learn how to analyze it in subsequent articles. We promise to keep and make it as simple as possible, as we always do. Harvesting data from web is also known as SCRAPING, and to scrape Twitter data you first need to have a basic twitter account. Why is it good to learn web scraping ? Such public data is quite good resource to know "What people are thinking about anything", be it a FMCG product or a politicians. You can use this FREE of cost data to do some analysis, and if you are able to extract good insights, you can publish it; there is no problem of someone blaming you of data theft. Now keep your R session open and open web browser along with. Go the link https://dev.twitter.com/apps and you would land on the Application Management page, where you need to sign in with your Twitter account credentials. Twitter is going to ask you to fill certain details, which you just fill in. It might ask you some other details, which vary case to case. 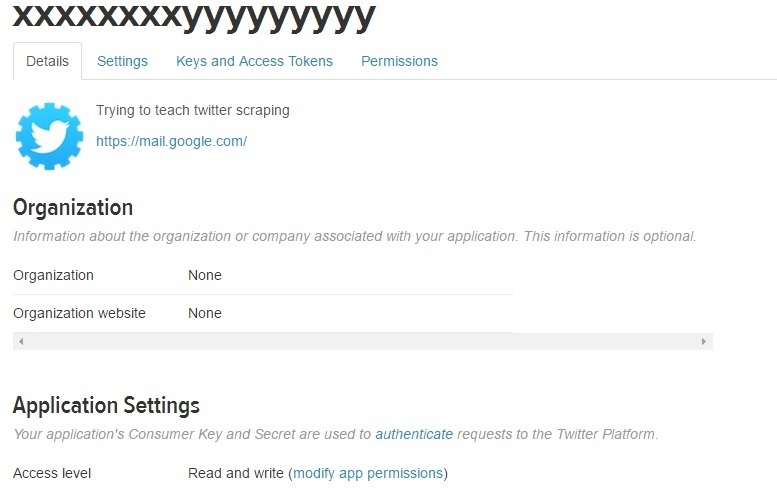 You can give some name to app, which is already not been used, I used "xxxxxxxxyyyyyyyyy" and then give some description. You then need to give a website name, if you have any, you can give is, else you can give any XYZ website name ( I used https://mail.google.com/) here for demo. Then you agree to TERMS and CONDITIONS, without wasting your time reading those and finally submit to land on the next page. There are mainly two ways of linking R and Twitter, here we are following the easy path. Later on public demand, we can explain the complex path too. 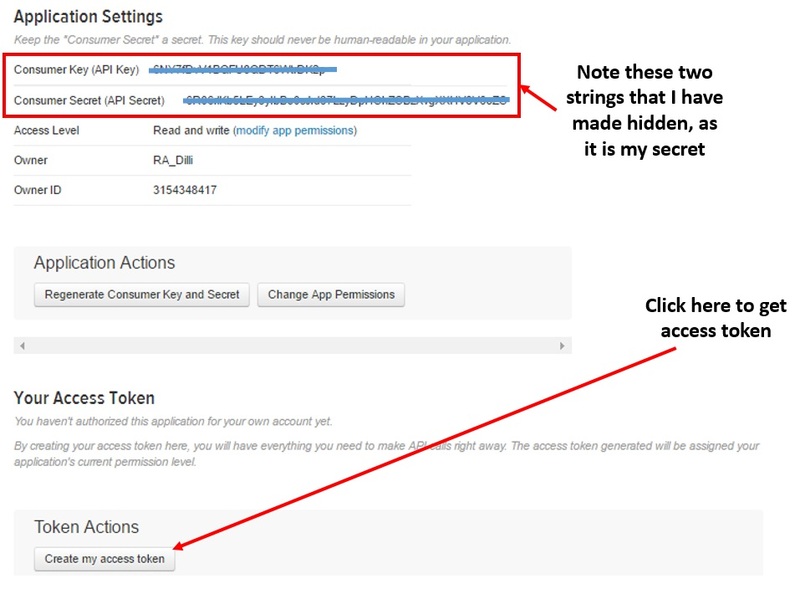 Now select Key and Access Token tab. It is time to take Token Action, as shown in picture above. So finally you have these 4 strings, keep it safe with you as these can be used time and again, you need not follow this process again. 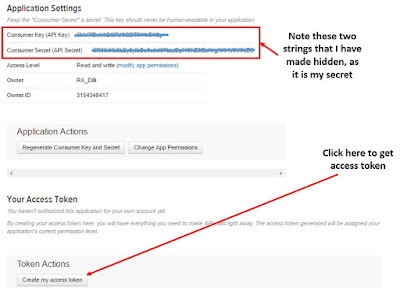 Consumer Key (API Key) = "xxxxxxxxxxxxxxxxxxxxxxxxxxxxxxxx"
Consumer Secret (API Secret) = "xxxxxxxxxxxxxxxxxxxxxxxxxxxxxxxx"
Access Token Secret = "xxxxxxxxxxxxxxxxxxxxxxxxxxxxxxxx"
Do remember that there is hyphen in Access token, it should not be removed. Now come to R Studio session. Let's store these all 4 keys into 4 vectors. # Now there comes a prompt in console which asks you for option, you need to write 1 in console itself and hit enter key. If there is no such prompt, there is no need to worry. Now it is time to extract tweets from Twitter, are you excited ??? I was very much excited while I did it first time. Let's see, what people are talking using #Kejiwal starting Apr 1, 2016. Now we have the data in R, we can do text mining on it and get some useful insights off it.